You just read the title of this post. What do you think we will be talking about? Of course, it can be a story about a person who had all those great qualities – but this is the wine blog, right? Can all those qualities belong to a grape? Let’s see. Parent – this is simple. When two grapes are crossed, they will give birth to the new grapes, and, of course, we can call both of the original grapes parents. Unsung hero? This is typically someone who can quietly come to the help of others and solve the big problem or save a life. Apart from saving a life, a grape can be very instrumental in assisting others to do their best, bringing out their best qualities while remaining literally unknown. For example, helping to make delicious wine as part of the blend. Now, the secret power? Every once in a while a person can be on a secret mission and save the world, all alone, “solo” – James Bond meets Wonder Woman, anyone? Okay, okay, I’m only talking about making delicious wines, all by itself, solo. Now, as we are talking about the grape, can you think of one which would fit this description? There are thousands of grapes used in winemaking, so theoretically, there is more than one grape which will fit this profile, but I would dare to say that one grape might stand above others in all these roles. Know what I’m about to say? There is a good chance you do – you probably guessed it already – I’m talking about Cabernet Franc. It is hard to tell when Cabernet Franc became known as a grape variety. It is definitely old, probably not as old as Chardonnay, which can trace its history all the way to the 11th century, but still older than most other grapes. While Cabernet Franc is typically associated with Bordeaux and Loire, it appears that it originated from the Basque Country in Spain, from where it spread through the south of France and reached Bordeaux. How Cabernet Franc is a Parent? Based on DNA research, Cabernet Franc was a parent of Cabernet Sauvignon, Merlot, and Carménère – a good group of kids, isn’t it? How is it an unsung hero? Cabernet Franc ripens at least one week earlier than Cabernet Sauvignon. It can reach phenolic ripeness in the years when Cabernet Sauvignon will not, and thus in the blend, it will be a savior – this is why it was always so loved in Bordeaux, an insurance policy of sorts. While the tasting profile of Cabernet Franc is somewhat similar to Cabernet Sauvignon, it is typically softer and less tannic than its more famous offspring, so it makes the blend more approachable. The Secret Power? When used in European wines, it is often unknown that the wine is made out of Cabernet Franc. For instance, Chateau Cheval Blanc, one of the most famous Bordeaux wines, is made predominantly out of the Cabernet Franc – but this is not widely known outside of the circle of wine aficionados. How about Olga Raffault Chinon? Chinon, a region in the Loire, is one of the best sources of delicious Cabernet Franc wines, but you have to simply know that. Coming to the new world, Cabernet Franc is not so secret anymore, as you can see it on the label, but I still can let you in on one little secret – this is one of the most versatile red grapes you can find. Talking about the United States, for instance, it is practically the only red grape which can consistently deliver delicious red wines both in California and in New York – and we don’t need to be so confined – Washington and Oregon are doing quite well with the Cabernet Franc, and so do Massachusets, New Jersey and even Rhode Island. And let’s not forget Canada, where the grape goes beyond dry reds and offers some of the most stunning dessert wines – Cabernet Franc Ice Wine. December 4th is when we celebrate this unique variety with the #CabFrancDay. The whole Cabernet Franc extravaganza is a product of obsession of one person – Lori Budd, who singlehandedly started this grape holiday in 2016. Lori expresses the love for the grape not just by talking about it – she also makes her own Cabernet Franc wine in Paso Robles under the Dracaena Wines label. This year I was able to try the Dracaena Wines Cabernet Franc at the wine bloggers conference, and I can tell you that while I’m very particular about Cabernet Franc wines (prefer more old world style than new), I really enjoyed Lori’s rendition. Grape holidays are always fun – you have a good reason to open a special bottle which was stashed in the corner, and share your love for the grape with the world. Cabernet Franc’s celebration is important beyond that simple joy. Take a look at Wikipedia article – it says that Cabernet Franc is “principally grown for blending with Cabernet Sauvignon and Merlot in the Bordeaux style, but can also be vinified alone”. The Vins de Bordeaux website says that Cabernet Franc “is the ultimate complementary grape variety”. While this is true, Cabernet Franc is great for blending, this is also the grape which is excellent by itself, and we should recognize and acknowledge that, and change that perception of a “blending grape”. This year, I had a great experience with beautiful Cabernet Franc wines from all over the world – 1982 Olga Raffault Chinon, Achaval-Ferrer Cabernet Franc from Argentina, Lieb Cabernet Franc from Long Island, New York, Dracaena Cabernet Franc from Paso Robles and many others. But to celebrate Cabernet Franc Day in style, I had an opportunity to open 3 more wines especially for the holiday – for one, representing both coasts of the USA – and, surprisingly enough, representing both styles of Cabernet Franc, the old world and the new world. 2014 ACORN Alegría Vineyards Cabernet Franc Russian River Valley (12.5% ABV, $38, 93% Cabernet Franc, 2% Malbec, 2% Merlot, 2% Petit Verdot, 1% Cabernet Sauvignon and Tannat, 18 months in barrel) was uniquely Californian in style – in many ways. Alegría Vineyards are Certified Sustainable, which is really the way now for many vineyards in California, with a lot of manual labor-intensive effort going into helping grapes to achieve their best potential. All the wines ACORN produces are made as field blends, where different grapes are co-fermented together, according to the century-old field-blend vineyard traditions. The result was beautifully balanced, fruit forward wine, boasting pure cassis flavors, supported by the medley of the red fruit and perfect acidity. The wine was clean and delicious. Two more wines were a total surprise for me. 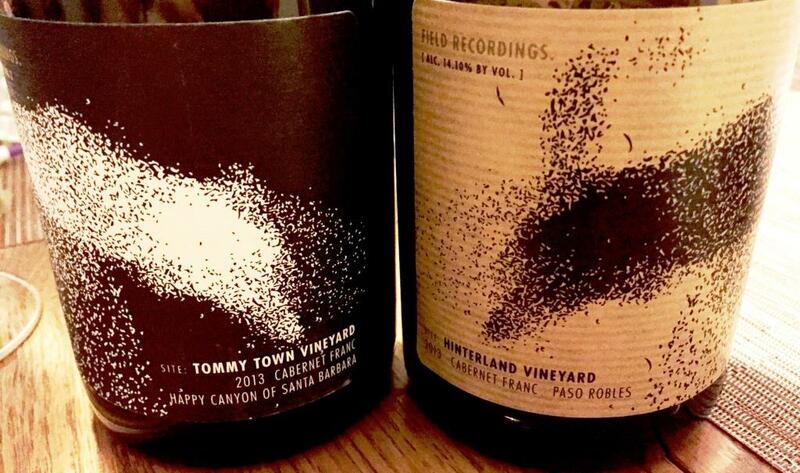 These two Cabernet Franc wines were both made in New Jersey. I have very little experience with New Jersey wines, and that experience was not necessarily all positive, so yes, I didn’t have much expectation as I was pulling the corks, just a hope that the wines would be at least palatable. While Unionville Vineyards were planted only in 1987 and the winery opened its doors to the public in 1993, the land where the vineyards a located was a farmland even before the 1850s. As a farmland, it went through many different plantings and such – peach orchard, apple orchard, dairy farm, grains, and horses – but returned to the fruits with the first grapevine plantings in 1987 – this is when the story of Unionville Vineyards started. 2014 Unionville Vineyards Amwell Ridge Cabernet Franc New Jersey (13.6% ABV) had dark garnet color in the glass. Intense nose, a touch of sweet tobacco, black currant. On the palate, interesting salinity first, following by clean acidity and then herbal notes. Mint, anise, a touch of blackcurrant – excellent Cab Franc rendition. Beneduce Vineyards is located in the same Hunterdon County as Unionville Vineyards. Chardonnay, Riesling, and Gewurztraminer are the main white grape varieties at Beneduce Vineyards, and the list of reds includes Pinot Noir, Blaufränkisch and, of course, Cabernet Franc. 2014 Beneduce Vineyards Cabernet Franc Hunterdon County (12.5% ABV) had dark garnet color in the glass. Fresh and crispy on the nose, with a touch of green bell pepper, dark chocolate, black currant – very impressive, Chinon-Style. Beautiful palate, with a touch of tannins, black currant, layers, well integrated, refreshing. If there is anything I want you to remember from this post, it is that Cabernet Franc power goes well beyond blends, and Cabernet Franc wines are well worth seeking from anywhere in the world. What is your view of the Cabernet Franc? 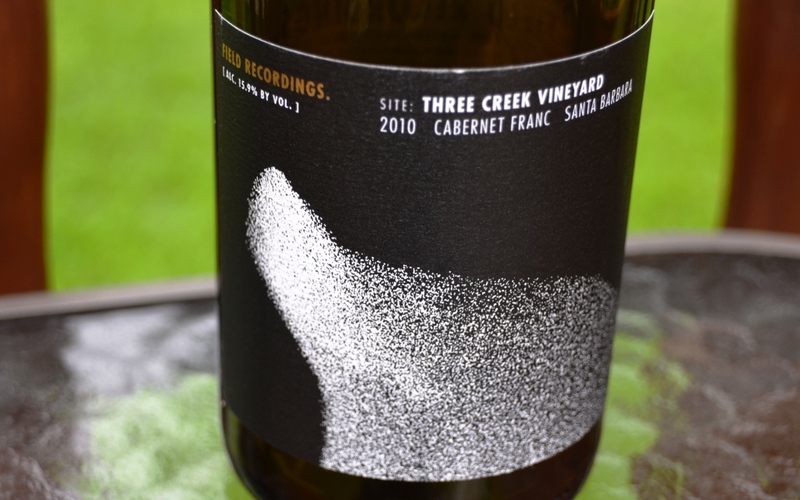 Do you have any favorite Cab Franc wines? Do you prefer old world or a new world style? What is the best Cab Franc wine you ever had? Cheers! Of course, Argentina wine industry can’t be subsided only to Malbec – Torrontes and Chardonnay for the whites and Malbec and Cabernet Sauvignon (and Bordeaux-style blends, of course) for the reds comprise an absolute majority of Argentinian wines available at any given moment. You can find some Argentinian Bonarda, Pinot Noir and Sauvignon Blanc, but they don’t carry the full recognition of the 4 main grapes. Winemaking has a long history in Argentina, starting in the 16th century and entering an international trade in the second half of 19th century. If we will take into account that most of the grape plantings in Argentina are at high altitude, with climatic conditions and terroir overall ideal for the grape growing and providing protection against many grape diseases, such as phylloxera, we will quickly realize that Argentina is home to some of the best and oldest vineyards in the world. However, it is only during the last 20-25 years Argentinian wines start receiving a full international recognition they deserve, with Malbec been the brightest shining star. Achaval-Ferrer winery was founded in 1998, and over its relatively short history, became a leading winery in Argentina, garnering numerous awards and high critic scores for its wines. To the great pleasure of wine geeks, wines of Achaval-Ferrer were also a focus of April #WineStudio educational program, allowing us to experience some of the very best wines Argentina is capable of producing – Malbec, Cabernet Sauvignon and Bordeaux blend called Quimera. But for the last April session, Achaval-Ferrer and #WineStudio took us on the trip in entirely new direction with the inaugural vintage of the Cabernet Franc wine. I guess it is time to reveal one of my (no, not darkest) deepest wine secrets – I have “a thing”, an obsessive passion for the Cabernet Franc wines. I can’t explain to you why or how. I don’t know how it happened that out of most grapes, the words “Cabernet Franc” make me literally jump. No matter how tired I am at the end of the large tasting, say to me “let’s go try Cab Franc” and I’m ready to run. Thus you can imagine how excited I was at this opportunity to try a new first release of Cabernet Franc. V: 8, nice, can be drunk on its own, will be great with the food, and will evolve with time – at least 10 years. The wine opened up more on the second day, and I’m sure will further improve on the 3rd. 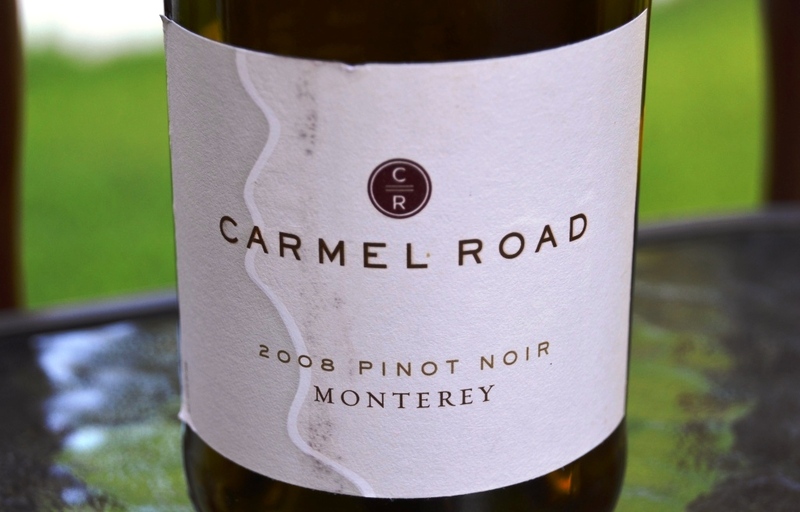 Definitely an excellent wine which will be hard to find – 1,400 cases total production, and a lot of this wine went to Morton’s steakhouse (so if you plan to visit Morton’s keep that in mind) – but it is well worth seeking. If you will score some of these bottles, lay them down in the cellar and let them evolve. At least this is what I would do. I can fully sign under every word here – beautiful, expressive wines, well representing what Argentina is capable of. Salud! A few days ago I told you about the live blogging session at the Wine Bloggers Conference 2016, dedicated to the White and Rosé wines. On the second day, we had a similar session, only now dedicated to the red wines. 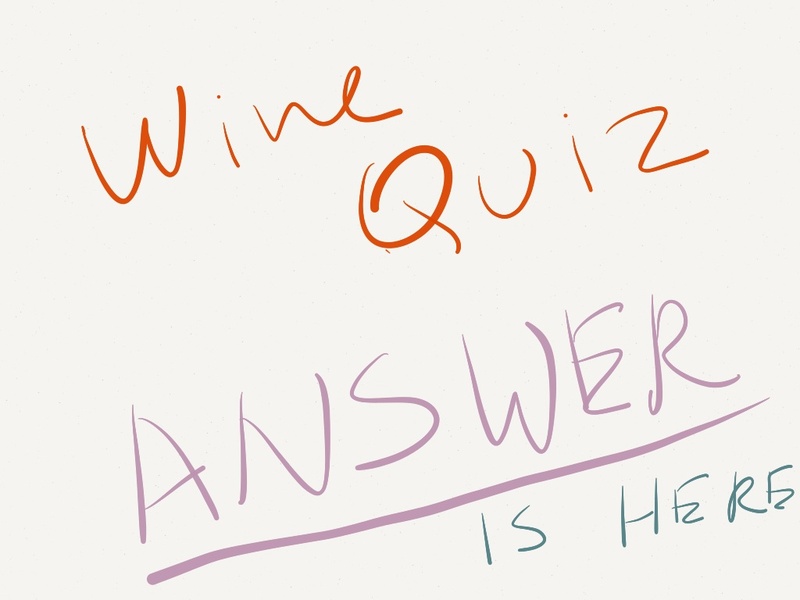 The same format – 60 minutes, 19 (or so) tables, 25 (or so) wines, 5 minutes to taste, take pictures, ask questions and share impressions in the social media, of course. Also with the higher chance of damage – clothes damage, it is, as we were dealing with red wine and time-pressed pourers. But this is part of fun, isn’t it? Same as before, I would like to offer to you my twitter notes. Just to make it even more fun, you can compare my notes with Jim Van Bergen’s, a fellow blogger we had a pleasure of sharing the table with (alongside other great people – I think we had the most fun table in the house). Wine #6: 2013 Peirano Estate ‘The Immortal’ Zin Old Vine Zinfandel (120 years old vines!) – if anything, the age of the vines commands utmost respect. Note that my tweet incorrectly puts the vintage as 2012, where it is 2013 (I blame it on the speed). Here we go, folks. As you can tell, I can’t even count – we had 11 wines and not 10 during these 60 minutes, but yes, it was lots of fun. And I’m far from being done talking about Wine Bloggers Conference 2016 in Lodi. Here we are again – November 2014 is now a history, so it is the time to summarize the wine experiences. Here is a run down of the best wines November had to offer – most of the wines are rated 8- or higher – with the exceptions possible. Well, I have to add that this post is somewhat unique. In a typical month, this would be really a summary, often including the wines already covered in the prior posts. This time around, I will include wines which will be still covered in the upcoming posts, so the links will be actually coming afterwords (flexibility of blogging doesn’t cease to amaze). What were your most memorable experiences of the last month? Cheers! Q1: One of the most famous wines in the world has Cabernet Franc as a major (2/3 or so) components of its blend. Do you know what wine is that? Q2: Cabernet Franc has a special relationship with the frost. Can you explain that? A2: Icewine! The grapes should be frozen on the vine in order to produce the Icewine. 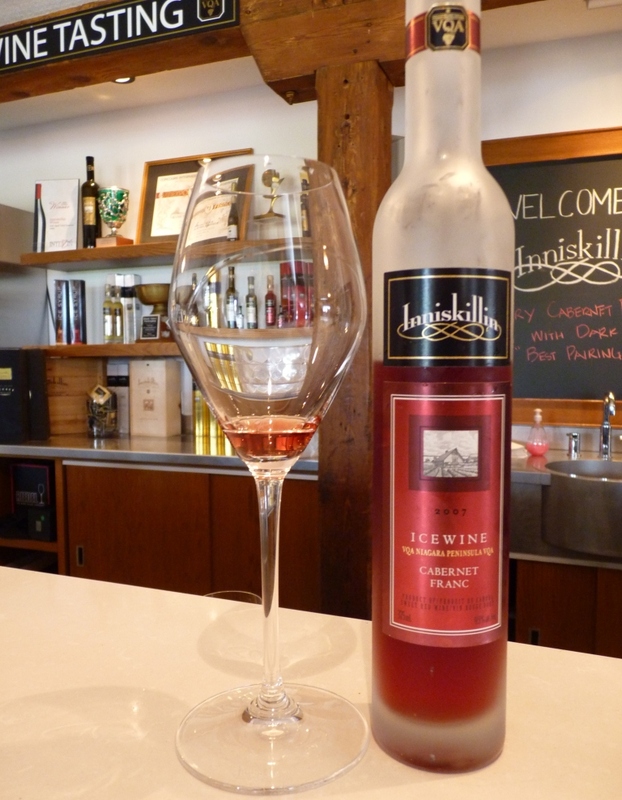 While Icewine was typically produced from the white grapes, Inniskillin estate in Ontario was one of the pioneers who started producing Icewine from the red grapes, namely Cabernet Franc. A3: Saint-Chinian. It is an AOC in Languedoc area which doesn’t make wines out of Cabernet Franc. The other three AOCs are located in the Loire, and all make Cabernet Franc wines. Q4: This unique grape grows only in one place in the world, and it is a cross between Merlot and Cabernet Franc. Do you know what grape it is? A4: Caberlot. I admit this was a difficult question. 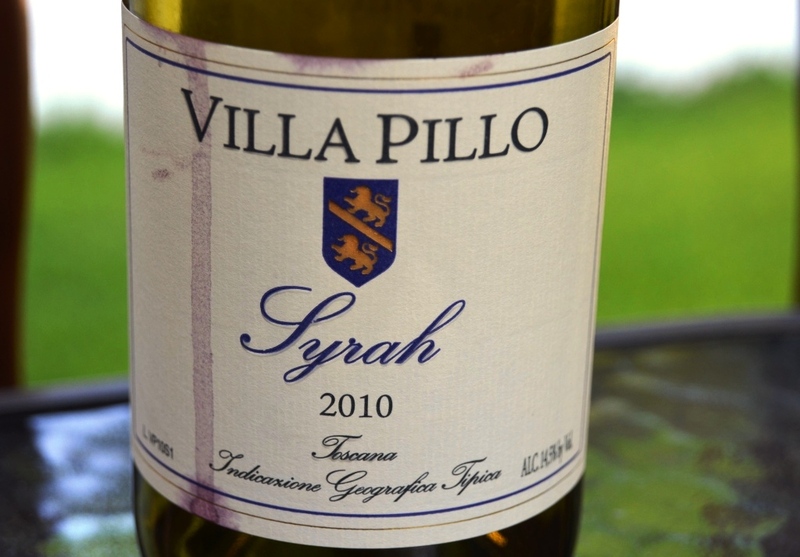 However, I mentioned this grape before, when I discovered it during VinItaly tasting this year (here is the link). Q5: In Italy, Cabernet Franc is often confused for another rare Bordeaux grape. Do you know the name of that rare grape? Looking at the results, we don’t have a winner today – however, both Frankly Wine and Eat with Namie get honorable mentions for properly answering 4 questions out of 5. Well done! Now, to the interesting stuff around the web and vine! Boy, what an eclectic mix I have for you today! First, just a quick last minute reminder – #MWWC4 vote closes today. If you still didn’t read and vote, you might have your last chance to do it here. Now, how much do you know about Chateau Latour? Same as the most, you probably heard of it as a producer of one of the most sought-after wines in the world, and you probably know that it is generally very expensive. Recently, Chateau Latour made a lot of press by pulling out of the En primeur (wine futures) system, where wines are acquired by consumers before they are actually released, hedging both on saving the money and availability of the wine. Here is the link to the Wine-Searcher article, where you can actually learn a lot of interesting facts about Chateau Latour. I also want to mention that Wine-searcher website is really becoming a great source of wine information, not just the price comparison tool. Next subject – Natural wines. How much do you know about natural wines? What do you think of them as a category? Well, the article I want to bring to your attention is not exactly natural wine 101 tutorial, but it is rather a rant by the Europe’s Best Sommelier of 2013, Arvid Rosengren, who is based in Copenhagen. A lot of his comments are most relevant for the local food and wine scene, but nevertheless, it makes a very interesting read. Are you a fan of Sauternes, a sweet wine gems from Bordeaux? If you are, I have a good news for you – 2013 is a great year, and you should be looking for these wines when they will be released. Contrary to 2012, when Chateau d’Yquem, the most coveted producer in Sauternes, decided not to produce their flagship Chateau d’Yquem wine, 2013 harvest shows a lot of botrytised grapes, which is a necessity to produce sweet wines in Sauternes. By the way, if you like red Bordeaux, 2013 doesn’t look all that great. Here is the link to the article where you can learn more. The last piece I have for you has nothing to do with wine. It is written by Kimberly at whiskeytangofoxtrot4 blog, where she is talking about the power of the words. While her post, called Word, sounds rather personal, I think it is a very powerful writing and it definitely will worth few minutes of your time. That’s all I have for you for today, folks. The glass is empty, but the refill is on its way. Cheers! We are continuing our grape trivia series, and we are back to the red grapes. 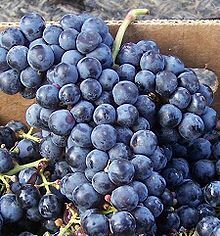 Today’s subject is the red grape called Cabernet Franc. According to many sources, Cabernet Franc is first appearing in Bordeaux in the 17th century, with a good chance of being around for much longer. From Bordeaux, it made it to Loire valley, where it is often used to produce single-varietal wines. In Bordeaux itself, Cabernet Franc is typically used as part of the blend together with Cabernet Sauvignon, Merlot, Petit Verdot and Malbec. Today Cabernet Franc is spread out all over the world, both used in Bordeaux-style blends (Meritage) and as single varietal bottlings – Australia, New Zealand, Italy, Chile, US, Argentina, Canada are all have a good amount of plantings of Cabernet Franc. In the US, Cabernet Franc is successfully grown all over the country, with some of the best wines coming from California, Washington and New York states. Cabernet Franc is known to be a parent of Cabernet Sauvignon ( together with Sauvignon Blanc), so the typical flavor profile of Cabernet Franc is somewhat similar to the Cabernet Sauvignon, with black currant, raspberries and green bell peppers flavors being most typical. At the same time, Cabernet Franc wines often have more earthy aromatics and a little bit lighter in the body. Cabernet Franc also buds and ripens at least a week earlier than Cabernet Sauvignon, and it is more resistant to the low freezing temperatures during winter, which allows it to be cultivated successfully in the colder climates. As promised, here is the second part of the Wines, Wines, Wines post. In the first part, we talked about great Riesling and Gewurzrtraminer wines, with some extra value wines and Prosecco. Let’s continue our “memorable wine extravaganza” with a couple of Chardonnays. It is so interesting how things work in life. You might walk past say, a picture, every day, and never notice it. And then all of a sudden you say “what is it? Was it always here, or is it something new? ?”, and people around you look at you like you have two heads or something. Where am I going with this? Give me a minute, I will make my point. Couple of month ago I got a bottle of Chardonnay, accompanied by the words “try it, it is pretty good”. 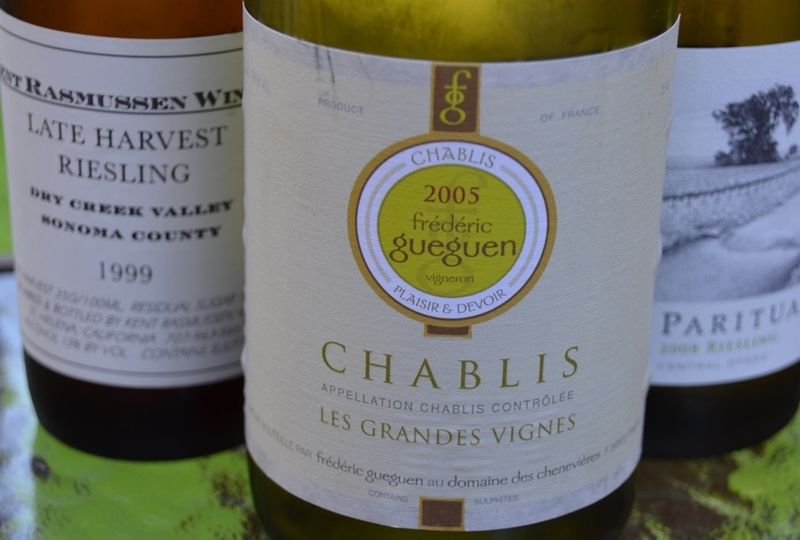 I’m a sucker for good Chardonnay (yeah, true, you can substitute “Chardonnay” with any other varietal – I’m just a sucker for any good wine, but this can be a subject for a different post). But this Chardonnay was from New Zealand. And New Zealand in by book is the land of Sauvignon Blanc and Pinot Noir – but not really a Chardonnay. So I finally got the bottle opened and … wow. Oh yes, you are still waiting for me to connect to the opening sentence about passing by and not seeing things around for the long time, right? As of very recently, as I walked in the New Zealand isle in the store, I noticed all of a sudden that almost every producer now features Chardonnay in addition to Sauvignon Blanc and Pinot Noir. 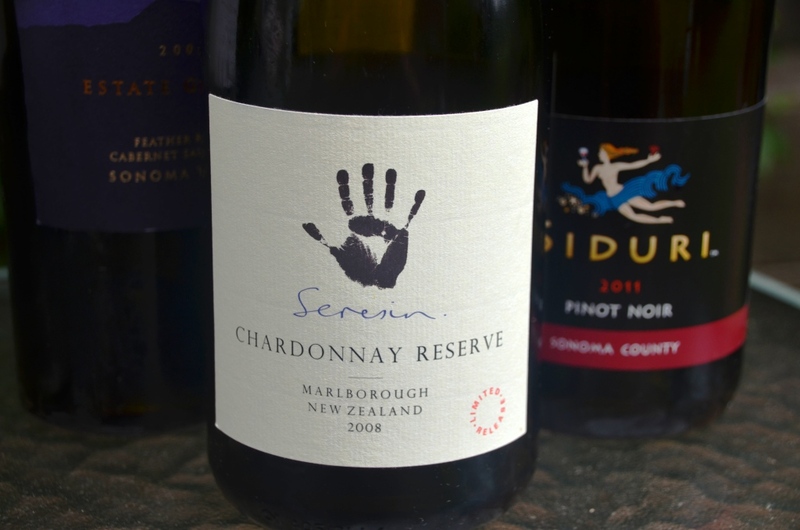 When did it happen, how long this was the case with New Zealand Chardonnays – I don’t have any idea, but based on this experience, I definitely want to try more. I have only one wine for you here, but it was mind blowing. Appearance of the large amount of Italian Syrah wines is also somewhat of a revelation, similar to the one I mentioned at the beginning of this post. 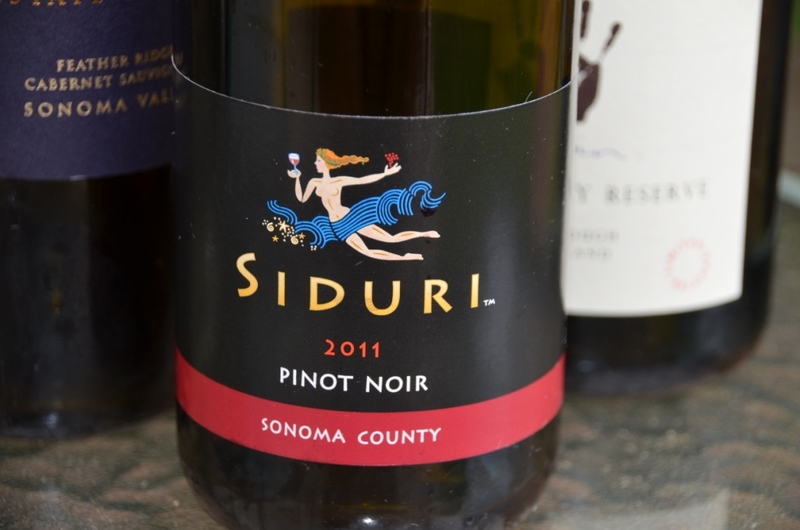 All of a sudden I start noticing that there are more Italian Syrah wines showing in the wine stores, and people are just talking more about them, in the blogs and otherwise. Whew, we are done here! Enjoy the rest of your weekend and cheers! During 2011 I wrote a number of posts for the project called The Art Of Life Magazine – of course talking about my favorite subject, wine. The project closed and even web site is down, but as I still like the posts I wrote, so I decided to re-post them in this blog. Also, in that project, posts were grouped into mini-series, such as “Best Hidden Secrets” you see here – I will continue re-posting them from time to time. After spending some time looking at hard-to-find-but-worth-seeking wines (Jerez and Madeira posts can be found here and here), let’s go back to the “hidden secrets” series. We agreed at the beginning that in this “secrets” series, we are looking for great wines which will bring a lot of pleasure – but will not require one to dip into pension savings to enjoy them pretty much every day. We talked about Rioja, second labels, French Sparkling wines and wines of Languedoc. Where should we go now? If anything, we are living through a wine renaissance period right now. Wine is very popular as a beverage among people of all ages and all walks of life, everywhere in the world. Wine is also made nowadays almost everywhere in the world – from China and India to downtown Chicago (I’m serious – you can read about it here). Does it mean that you can universally enjoy wines made anywhere in the world? Of course not (not yet? May be, but I can’t predict the future). Taking out of equation exotic wines made in exotic regions, what are we left with? There are a number of well know wine making regions – Alsace, Bordeaux, Burgundy, Champagne and Rhone in France, Piedmont and Tuscany in Italy, Germany (as one big Riesling-making region), Rioja, Ribera Del Duero and Priorat in Spain, Porto in Portugal, Australia and New Zealand (often taken as a whole), United States with Napa and then Sonoma being most prominent, and hopefully Washington and Oregon being also well known outside of the US, and Chile and Argentina, as still relative newcomers in the wine world. How did I come up with this list? Before someone gets upset for his or her favorite regions not being mentioned, or all 70+ regions of Australia not being accounted for, let me explain the logic here – it is simple. Each of the regions listed above (even with the whole country lumped as one) makes tens or may be hundreds of the wines which are in a high demand. How can we estimate the demand? When wine is in demand, it typically starts going up in price. Each one of the above mentioned regions has many wines priced in the hundreds or thousands of dollars per bottle (anyone who wants to check is welcome to look for Screaming Eagle, Chateau Petrus, Krug Champagne or Vega Sicilia on wine-searcher). Yes, you are absolutely right – not all the wines produced in Bordeaux or any other famed region cost hundreds of dollars, there are many which cost between $10 and $20. True, but in many cases consistency of those wines might be in question – meaning, you never know what you are getting for your ten or twenty dollars. Of course probability of finding very good and reasonably priced wine is getting better and better in today’s world – but you can even further improve it by stepping out of familiar circle and looking for wines from under-appreciated regions. So what are those under-appreciated regions? As you can imagine, there are lots of them. Again, all the exotic places aside, for each famous wine region, the same countries have tens of “under-appreciated” regions, consistently making good wines for hundreds of years, with majority of those wines being also reasonably priced. In France, great wines are made in Loire, Provence, Jura, Languedoc-Roussillon (we already talked about them) and many other places. In Italy, excellent wines are made in Umbria, Sicily, Lombardy, Marche and again in many other regions. Rias Baixas, Bierzo, Jumilla and La Mancha in Spain; Long Island, Virginia and Texas in United States, South Africa, Israel, Lebanon, Greece, Georgia and Hungary… There is no limit to the places where now we can look for consistently good wines. As usual, time to open a bottle, right? Let me give you a few examples from the regions which I believe are under-appreciated. Let’s start in Italy, in the region called Marche, which is located on Adriatic coast of Italy, near Ancona. There are a number of great wines produced in that region, which is still staying off the radar for the most of the wine lovers. Particularly, white wines made out of the grape called Verdicchio, Verdicchio dei Castelli di Jesi and Verdicchio di Matelica are excellent white wines, with balanced acidity and fruit, perfect for summer day. The red wines are made mostly out of Sangiovese and Montepulciano grapes. 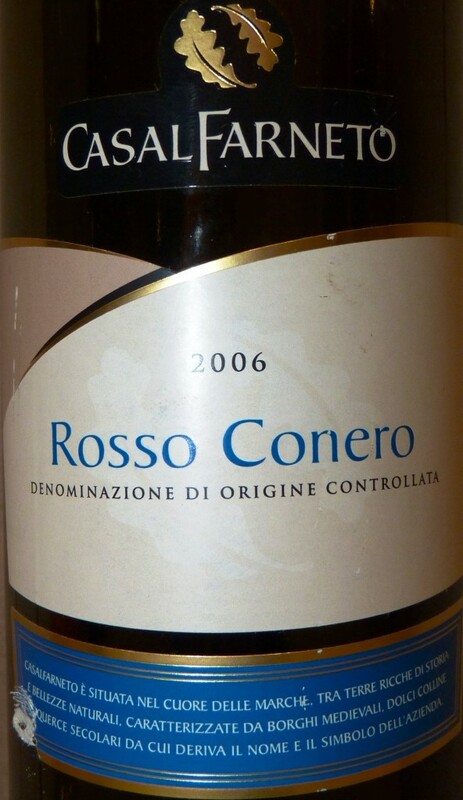 This particular 2006 Casal Farneto Rosso Conero IGT is made of the blend of Montepulciano and Sangiovese, and it is an excellent red wine with lots of layers and luscious red and black fruit on the palate (think of blackberries and sour cherries), perfectly balanced. Let’s move from region Marche in Italy to France. Here is our first wine, coming from Vouvray region in Loire valley. Loire is home for many different wine regions, all producing interesting but lesser known wines, may be with an exception of Sancerre (I might be really stretching this “may be”). Vouvray wines are made out of the grape called Chenin Blanc, which produces wide range of wines from very dry to very sweet. 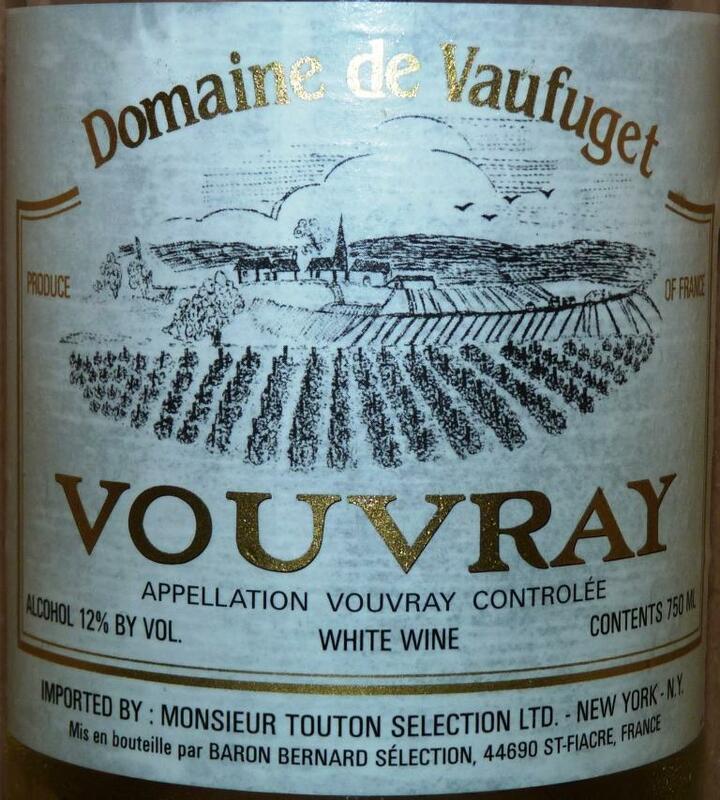 This particular 2009 Domaine de Vaufuget Vouvray AOC is very nice and pleasant, showing some sweetness (probably equivalent to Spatlese Riesling). It is easy to drink and should be great accompaniment to many summer meals. Last but not least for today is red wine coming again from Loire Valley, from the region called Chinon. As many other red wines in Loire region, Chinon wines are made out of the Cabernet Franc grape, with an addition of some other grapes. Cabernet Franc is typically used as a blending grape in Bordeaux and California, but it also produces great wines on its own, in all the different regions throughout the world. 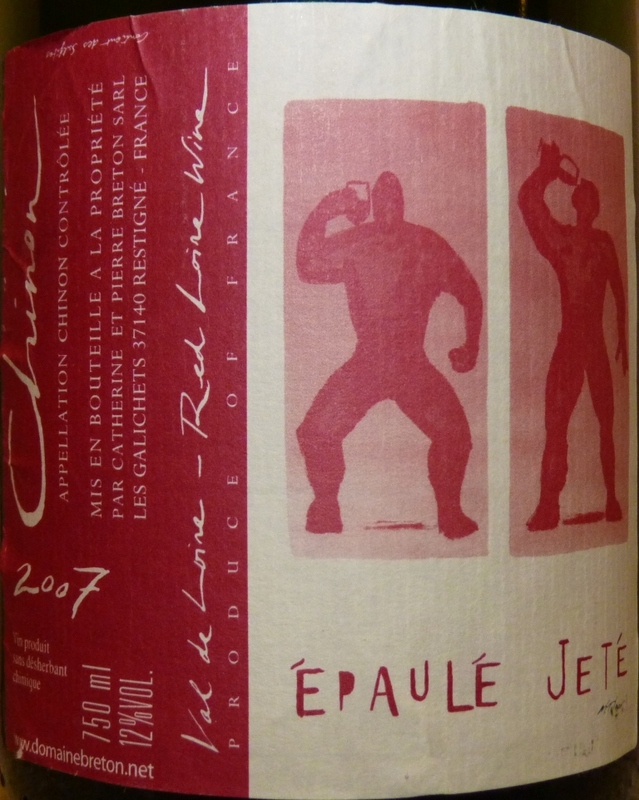 This 2007 Epaule Jete Chinon required extensive time to open up, but after three days, finally became drinkable, showing earthiness, fruit and acidity, all in harmonious balance. Not sure if I was convincing enough, but next time you are in a wine store, look for unfamiliar wines from unfamiliar places – it is possible that you will make a great discovery. As subject of under-appreciated wines is almost endless, I will give you many more examples of great wines from no-so-well-known places. Until then – let’s drink to fearless wine tasting and great discoveries.